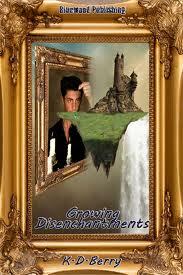 Anyone in the market for an entertaining fantasy read, one that's lightly fun and amusingly inventive, should consider Growing Disenchantments, by K.D. Berry (2012, Bluewood Publishing, labeled YA, but suitable for adults). It's not, you know, a World Altering reading experience of Emotional Power, but it is a fine way to spend a snowy day. It was on such a day that I entered the world of Ragonnard, the new wizard in town, just as the young thief Ganfrey (a girl, and no unskilled) was about to break into his house. Unfortunately for Ganfrey (although it all worked out in the end), Ragonnard's home proved hard to burgle, and she ended up being caught. But he made a deal with her--steal a particular portrait from the king's castle, and all would be forgiven. That particular portrait, a prison painted to hold a long gone evil wizard, was one Ragonnard had been searching for with a particular passion. Painted along with with the wizard is an amulet of particular power, and Ragonnard's plan is to extract the amulet, bringing it back to real world while leaving the wizard in painted place. Things don't work out according to plan, and the evil magician is freed. Ganfrey finds herself caught up in chaos as his magic take over the castle, sending the optimistically incompetent king out on to the streets, and freeing the stone gargoyles and animating the statues of long dead kings. But there are things more serious afoot than the deposing of kings and the philosophical conversations of gargoyles. The magician is bent on revenge on those who imprisoned him 500 years ago, and he won't let time stand in his way. Unless Ganfry and Ragonnard, with the help of a time travelling agent from the future, the court illusionist, Dewdop, and the head of castle security (who spends his free time reading mysteries, and trying to apply them in real life), can stop him, all of time's coherence will be shattered! Entertaining stuff. I found the characters amusing, although not desperately three dimensional, and the more I read, the faster the pages turned as the excitement of the story grew. The reader has to have a certain tolerance for a bit of slapstick, almost cartoonish in places, and some awful puns (the sentient broom, for instance, is described at one point as a "heaving besom"), and a certain tolerance for plot elements that don't necessarily seem as tidily integrated into the whole as they might have been (time travelling agent from the future, popping up naked every now and then, and not actually doing much that's helpful, I'm looking at you). But if you just sit back and relax and enjoy the ride, it's lots of fun. Not quite up to the level of the Discworld books, which are my current gold standard of amusing fantasy, but a good time nonetheless. The book is the second in a series (the first being Dragons Away), but is perfectly fine as a stand alone. It's published in New Zealand, but it's available from Amazon as both a book and a kindle edition. Disclaimer: I received a copy courtesy of the author (or at least, courtesy of half the author, since this was a team effort). Sounds like a fun book. Thanks for letting us know about it. I'll see if I can get it at the library.